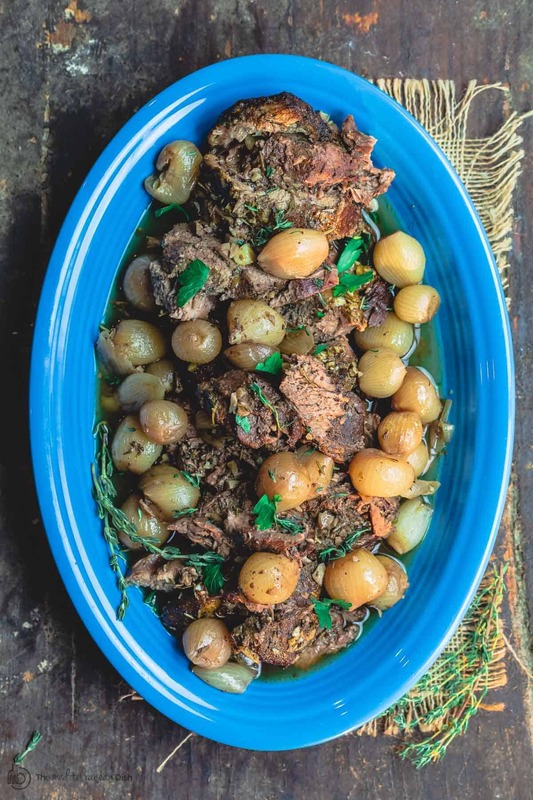 Turn this awesome leg of lamb into a Greek feast! 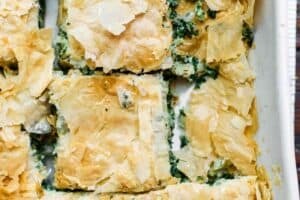 Side options: Greek roasted potatoes; Lebanese rice; Spanakopita; Traditional Greek Salad; Greek Green Bean Salad; Fasolada; Tzatziki Sauce; and Creamy Hummus. But, if you’re new to working with lamb, it can be intimidating to start with a big bone-in lamb leg. Good news is, you don’t have to! Boneless leg of lamb can be just as impressive a dish. And in this recipe, we let the slow cooker do all the heavy lifting. Because, let’s face it, who doesn’t love the ease of dumping everything into the crock, push a button, walk away, and return to a hot, fall-apart piece of meat ready to serve?! 2. To Sear or Not to Sear? It’s true that searing (or browning) the lamb before cooking is not a strictly necessary step, but it creates a beautiful crust and a deeper flavor! For me, it’s worth the little extra effort. 3. Flavor the Lamb Well. Many people dismiss lamb because it’s “too gamy,” they say. The common mistake they make is that they don’t appropriately flavor it. 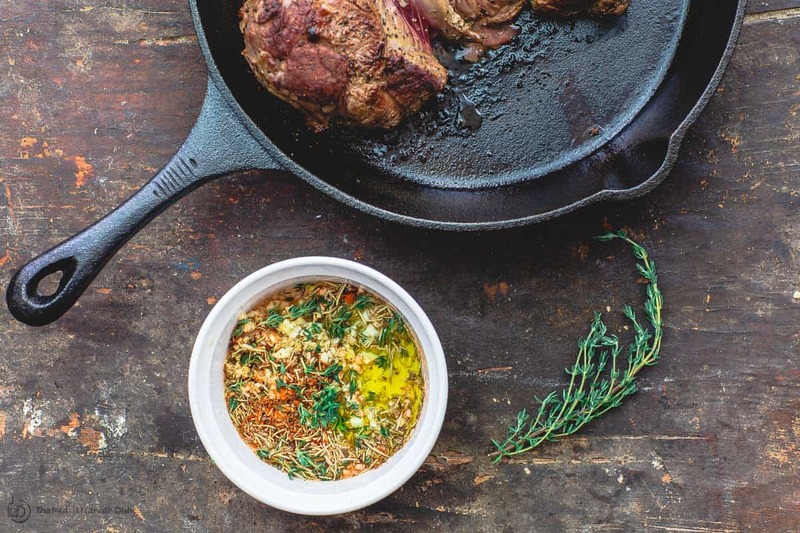 In this recipe, we give our leg of lamb proper TLC with some favorite Greek flavors–loads of garlic, rosemary, oregano, fresh thyme, citrus and quality extra virgin olive oil. 1. First, once you trim the fat off the leg of lamb, season only with salt and pepper. (If you have the time, let the lamb rest at room temperature for up to 1 hour.) 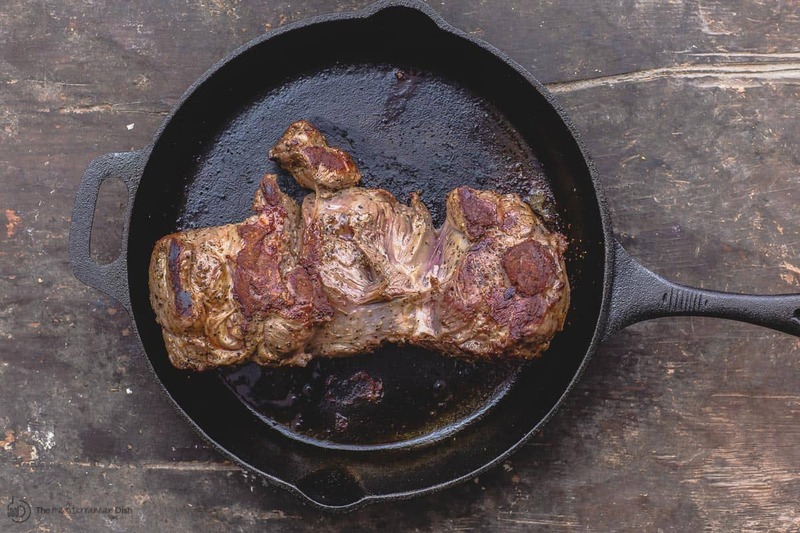 Brown lamb in a cast iron skillet that’s been coated with a little bit of extra virgin olive oil. 3. Prepare your slow cooker (crock pot). Add pearl onions to the bottom of the pot, then add the liquid (wine and broth) and top with the spiced lamb. 4. Now let the slow cooker do its magic! 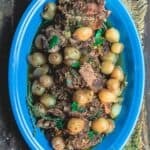 Cover slow cooker and set on high for 4 hours or on low for 6 to 7 hours or until lamb is super tender that it falls apart at the poke of your fork! Transfer to a serving platter and add some of that beautiful juice on top or to the side! 1. Pre-heat your oven to 350 degrees F.
2. Brown the lamb as stated in the recipe, but this time use your Dutch oven or large oven-save pot. Remove lamb, and once cooled, make slits and add garlic slivers then apply the garlic spice rub just as directed in the recipe. 3. Place pearl onions in Dutch oven (or prepared oven-safe pot). Add 1 1/2 cups red wine and 2 cups broth. 4. Add lamb to the Dutch oven. Bring to a boil for about 7 to 9 minutes, then cover and transfer to the oven for 2 to 2 1/2 hours or until lamb is very tender. IMPORTANT: be sure to check periodically and add a little more liquid as needed. When lamb is finished, liquid will have reduced to about 1/3 of what it was when you started. Don’t Miss a Recipe! 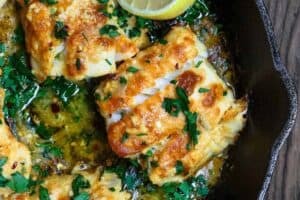 Join my free e-mail list to get latest recipes, Mediterranean dinner meal plans and more. Shop Our Online Store for best olive oils, all-natural spices and more! Flavorful, fall-apart tender boneless leg of lamb, seasoned Greek-style with loads of garlic, rosemary, oregano. 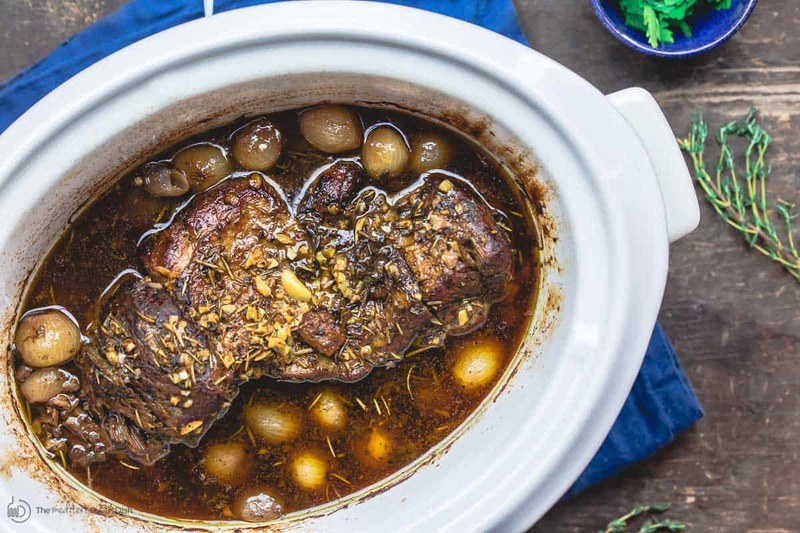 Let your slow cooker do all the magic as this lamb leg cooks along with pearl onions in a special wine broth. See notes if you need braising instructions instead. And be sure to check out all the suggestions for what to serve along. Coat the bottom of a large skillet (I used my cast iron skillet) with a little bit of extra virgin olive oil. Heat skillet over medium heat until oil is shimmering but not smoking. Add the lamb and brown well on all sides (increase heat to medium-high if needed); about 7 minutes. Remove from heat and let cool enough to handle. Cut a few slits into the lamb on both sides and insert a slice of garlic in each of the slits. Now make a wet garlic spice rub for the lamb. In a small bowl, combine the minced garlic, rosemary, thyme, oregano, and paprika. Add lemon juice and 3 tbsp extra virgin olive oil. Coat lamb on all sides with the garlic spice rub. Add pearl onions (or shallots) to the bottom of a large slow cooker (crock pot). Add wine and broth, then add the spiced lamb on top. 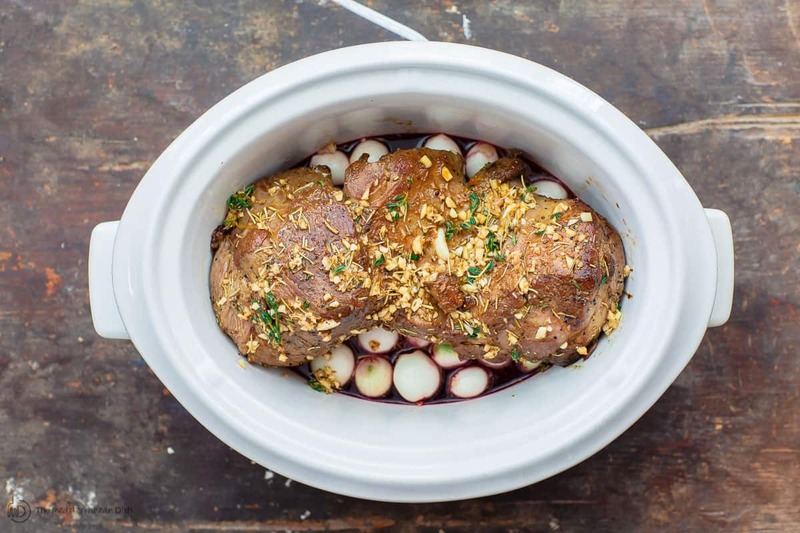 Cover slow cooker and set on high for 3 to 4 hours or on low for 5 to 6 hours until lamb is fork-tender and you can easily pull it apart. Cook’s Tips: Start with quality lamb from a trusted source or butcher, it makes a difference. And remember, slow cookers vary, so do check on your lamb occasionally as it might be ready sooner or latter than indicated in the recipe. 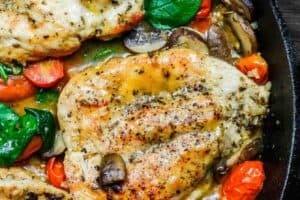 Don’t have a slow cooker? 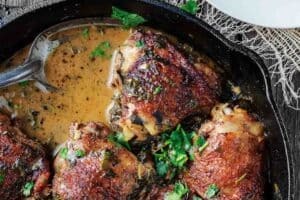 You can make this in your Dutch oven or oven-safe pot. 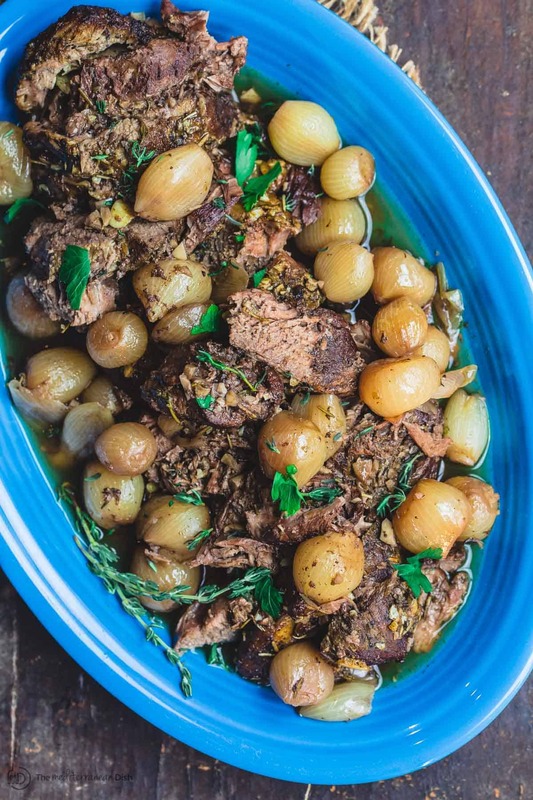 The answer here is: braised lamb leg. Important note: You will need to increase the liquid amount from 1 1/2 cups to 3 1/2 cups. 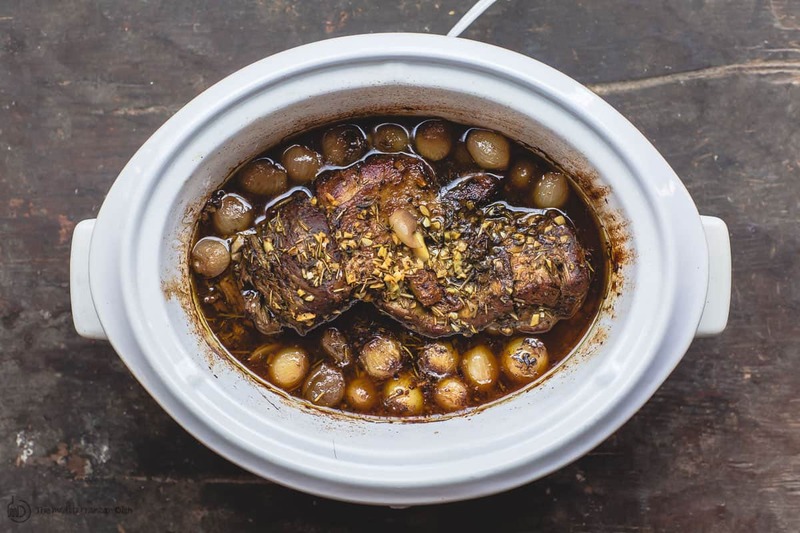 Here is how it goes: Pre-heat your oven to 350 degrees F. Brown the lamb as stated in the recipe, but this time use your Dutch oven or large oven-save pot. Remove lamb, and once cooled, make slits and add garlic slivers then apply the garlic spice rub just as directed in the recipe. Place pearl onions in Dutch oven (or prepared oven-safe pot). Add 1 1/2 cups red wine and 2 cups broth. Add lamb to the Dutch oven. Bring to a boil for about 7 to 9 minutes, then cover and transfer to the oven for 2 to 2 1/2 hours or until lamb is very tender. Make sure to check periodically and add more liquid as needed. Remember that ovens vary and your lamb may take a shorter or longer time to cook. When lamb is finished, liquid will have reduced to about 1/3 of what it was when you started. Leftovers? Refrigerate leftovers in a tight-lid glass container for 3 to 4 nights or freeze for later use. Warm thawed leftovers in a medium-heated oven; be sure to add enough liquid to your pan and cover with foil till warmed through. 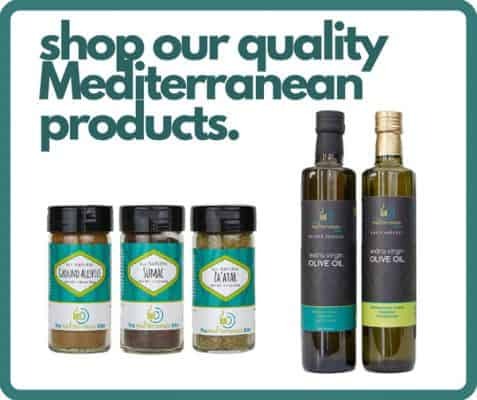 Visit The Mediterranean Dish Store for all-natural and organic spices and our Greek extra virgin olive oils! I hadn’t really planned ahead what to have on Easter since it was just going to be my husband and myself. On a whim yesterday, I bought a boneless Leg of Lamb and found your recipe as I was searching for how to cook it. This turned out SO good today! I put it in he crock pot this morning before church and let it cook on high for 4 hours. I had to make a couple modifications, simply because I didn’t have lemon juice or red wine. 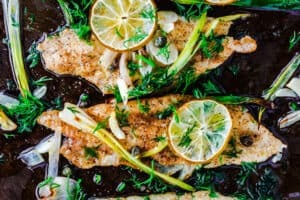 I used white wine vinegar in place of lemon juice and used a splash of balsamic vinegar with the broth instead of adding the red wine. I also included some small new potatoes and carrots with the pearl onions in the bottom of the crockpot before putting the Lamb on top. Everything was incredibly flavorful, juicy and tender. Will definitely make again! Thanks for helping make our Easter meal special. Wonderful, Joy! Thank you so much for sharing!! Hi Gwen, hopefully you found the answer to your question in the recipe notes under “leftovers.” You can warm this in a medium-heated oven; be sure to add enough liquid to your pan and cover with foil till warmed through. The liquid helps it warm through without drying. Hey Tamar, so you can double up on the spices and garlic just fine. The recipe allows for that, and it’s very forgiving. As far as cooking time, it will depend what setting you use. If you set the slow-cooker on high, it’ll probably take around 5 hours…hard to say for sure. Honestly, with slow cookers, I start checking at 4 hours and every hour after until the meat is so tender that it’s falls apart.